It has been just a month now since I was selected by IBM from a broad group of nominations to become a Champion for Information Management. From what I have learned there are <200 of us worldwide (smaller than the average InfoSphere sales team from IBM that I see call on some of my clients!). There are a number of categories for IBM Champions (http://www.ibm.com/developerworks/champion/) but perhaps I am a bit biased when I say that Information Management seems to one of the broadest and perhaps most difficult to speak to in a succinct fashion. What is Information Management anyways? In a world where everything has been reduced to buzz words and catch phrases the intrinsic meaning of a subject like Information Management is lost amongst the chatter IMO. I like to define it as “The Discipline and Science of Managing Information over its entire lifecycle and treating it as an Asset to be leveraged by the entire Enterprise in which to create sustainable sources of Competitive Advantage”. There are many tomes written on Enterprise Information Management and most have a similar view to mine. 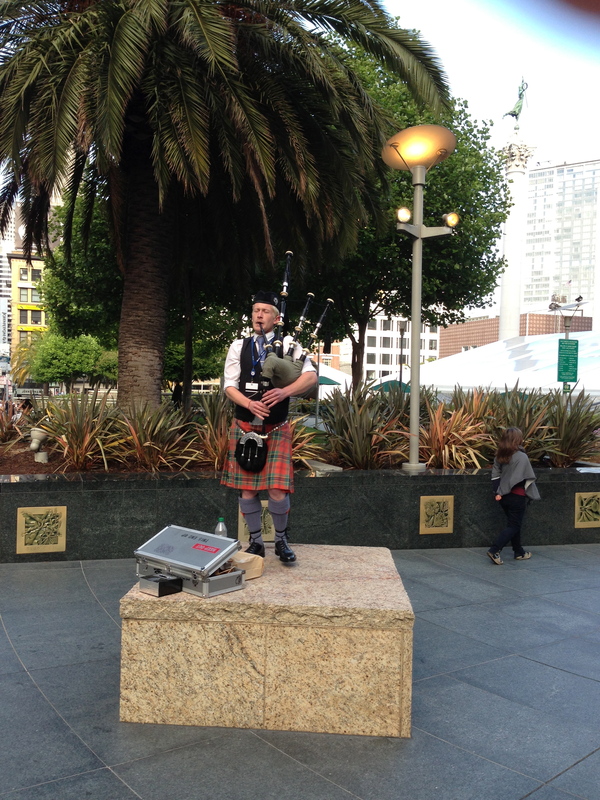 However, given the myopic focus on Big Data and the non-stop hype as to its virtues and disruptive capabilities I often feel like this Lone Piper who I came across this last week in Union Square (San Francisco). My music (i.e. message) may be well liked once you hear it, but it can be easily be lost in the din of hype (or traffic) around it. I learned today that my preso for IOD 2013 was not selected so I can see that my role of Champion has limited clout. I was looking forward to espousing my belief that “Leveraging Information Governance can Achieve Strategic Business Outcomes”. I guess that I will have to shop around for another forum in which to “play my music”. I am looking forward to seeing many of you later this month at the DGIQ Conference in San Diego. It is going to be the largest ever and no doubt most interesting as the maturing and benefits of Information Governance are really starting to manifest for many enterprises.